The piano etudes by Chopin: Franz Liszt was so impressed with these works, he took them home with him so he could practice them. Many piano students, though, would be perfectly happy to pass them up… These exquisite diamonds can only be successfully played by the most gifted keyboard virtuosos. 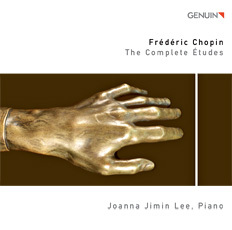 Joanna Jimin Lee dances through the cosmos of the Polish-French composer’s works with polished elegance and deftness of touch. Do you play a stringed instrument? You will be delighted! Are you a pianist? Be prepared for something amazing!